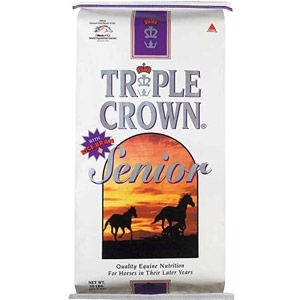 Developed specifically for older horses, this formula features a higher nutrient content to compensate for a less than effective digestive system. A higher fat content provides the extra energy older horses need. Plus, it is softer, more easily digested and can be mixed with water to form a mash for horses who experience difficulty chewing and swallowing. Has enough bulk fiber to be used as the sole ration for horses unable to eat hay or pasture. It can also be used with good quality hay. Available in 50 lb. bags.